Hot from Mozilla’s oven, the new Firefox 3.1 Beta 2 is now available for download and trial. Without much surprise, this new release includes the long talking new Private Browsing Mode feature. Similar to Google Chrome’s Incognito mode and Safari’s Private Browsing, this significant feature allows users to browse internet in a more secure environment without leaving any traceable tracks when it is activated. Another significant change found in this release is the fantastic speedy TraceMonkey JaveScript engine which is now enabled by default. Prior to this, users who want to activate this engine need to manually configure it. With this feature enabled by default in the latest release, users are saved a lot of hassle and can enjoy a more powerful Firefox 3 in terms of performance and speed. Besides the above features, Firefox 3.1 Beta 2 has also removed the tab-switching behavior based on feedback from users. This new tab switcher was introduced in the first alpha version. This tab switcher displays thumbnail previews of pages and it also changes the behavior of the default tab switching shortcut so that the tabs would be rotated according to the most current and updated use. Even though this feature has enhanced the user interface, the developers has decided to take it off as a lot of work needs to be done before this graphical tab switcher can emerge in its complete form. 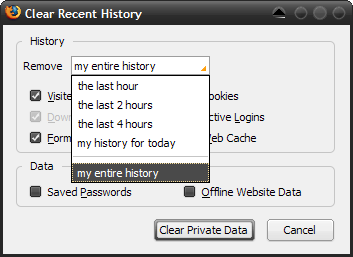 Added functions to make it easy to clear recent history by time as well as remove all traces of a website. New support for web worker threads. Improvements to the Gecko layout engine, including speculative parsing for faster content rendering. Firefox users who want to try Beta 2 can download it from Mozilla’s web site via the link here. It is free for all platforms. To avoid unnecessary problems which might arise from this beta version, users are advised to back up their existing Mozilla profile prior to trying.